Summer is here and holiday season is upon us, we have all been bombared by the diet post's, detoxes and more but what about our feet? They deserve some love to don't they? 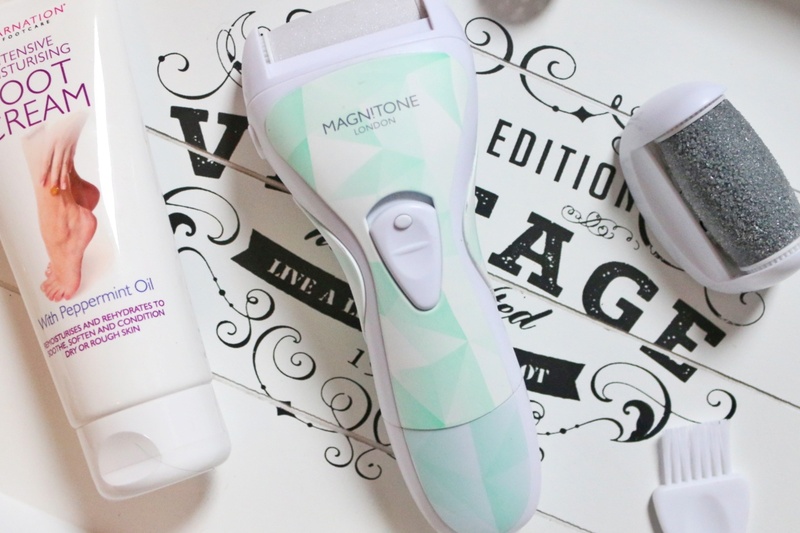 Well today I'll be telling you all about the Magnitone Well Heeled Pedicure system. When it comes to skincare I am on top of that, I make sure to keep everything feeling smooth and looking amazing but I always tend to forget about my feet, I never take care of them even though I should as they get me from A to B, They keep me standing, they carry everything so why shouldn't I keep them in perfect condition, surely they should feel the love to? 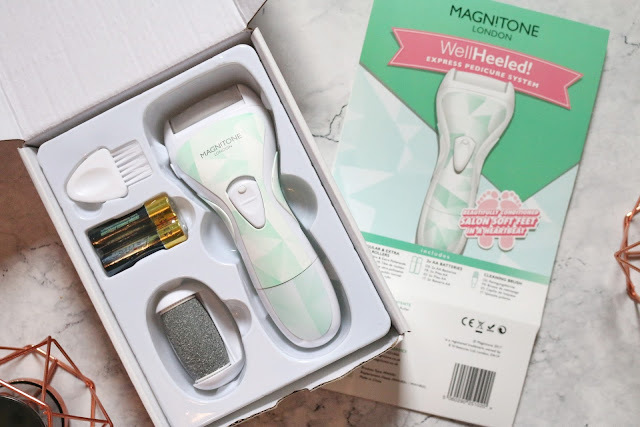 Well this summer I wanted to make sure I do take care of them, that I keep them looking fab so that I can wear sandals without worry and this little tool from Magnitone is just the product to help me. 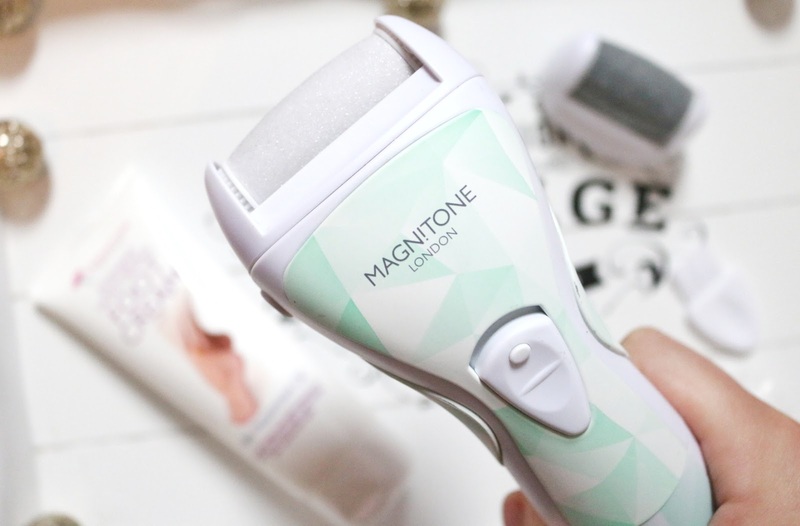 Before we go any further I just want to tell you all how amazing the customer service from Magnitone is. Unfortunately the first one I received the whole front came off of it so I was sent a replacement in record time from the PR I have been working with. I can't explain how amazing she was with this problem and couldn't be more apologetic. It's nice to know that they care about the quality of their items. I also decided to buy one for my gran for her birthday in their flash summer sale which had 30% off! such an amazing bargain but like the one I received the front came off so I got in contact with their actual customer service team and again, they couldn't have been nicer and were really helpful. I was given a tracking postage label to send the item back to them so I could receive a replacement and the whole process couldn't be easier. I love companies who really value their customers and can't do enough to help, it's so refreshing after hearing many of horror stories. This little pedi system is perfect of any pamper night and can help you get your feet ready for the season of sandals, bare feet and lazing about in the sun. For years I have always been worried about my feet when I go on holiday or wear sandals because I do have some hard skin on my heels but it's because I just haven't taken enough care of them which is 100% my fault so now that I am on a mission to get them back to silky smooth feet that I can be proud of when strutting around this well heeled pedi is perfect. Using this on my skin feels great, I mean it does feel a little daunting when you think about one of these going near your skin because well, it's moving fast and looks like a really rough nail file but fear not as there is no pain involved! I literally didn't feel a thing when using this and afterwards my feet felt AMAZING! I just couldn't believe how well it worked. You use this on dry and hard skin but is for FEET only, it gently buffs away all the dry and hard skin eassily in seconds. With this you get the well heeled pedi system, two batteries, a little brush for getting rid of the skin that comes off, regular and extra buff rollers plus a cap to put on the roller that's attached to your system. The whole thing isn't too heavy and can fit perfectly into any wash bag so you can take it away with you, the perfect pedi system for travelling. This is also splashproof, 360 rotation, has longer lasting micro-crystal rollers and has a curved design for better results under toes. This really is the perfect addition to any pamper evening as you can get your face mask on, get your feet looking better then pop some polish on your toes. Boom! Done. It's also amazing for lazy nights when you really can't be bothered, it's fast, effective and gets the job done with minimal effort. So what ever you are doing, you can get your feet looking good, healthy and ready for the runway that is life. "Gently and effectively buffs away dry, hard and rough skin from feet. With longer-lasting, dome-shaped, micro-crystal rollers for better results under-toes and along the curves of feet. It’s lightweight, waterproof, fast drying and perfect for travel"
I must say that I have thoroughly enjoyed using this, my feet feel so smooth and it works like a dream. It's not too rough on my skin, doesn't feel sore and I can do it even if I'm feeling lazy. It's the ultimate tool for keeping your feet in tip top condition plus it's only £24.99! How amazing?! Such a fab price for a well executed item. I could do with one of these myself. The price is great too! For that price I think it is definitely worth trying. Thanks! I am super lazy when it comes to my beauty routine so this would be perfect for my feet. They are in desperate need of a pedi! Thank you for commenting 💖 I love their stuff, they all work so well. I have a similar gadget, I love it. They are handy to have around. This sounds like something I need! I have always suffered with my feet and this is something I've never thought to buy. Love that you got good customer service from them, that's always so important and unfortunately some brands just aren't always as helpful! Thank you for commenting 💖 I love that they have such good customer service! It's really nice to see. My mum is burdened with dry feet so I'll show her this to see if it would suit her. And my partner has awful cracked heels...) Thanks! I have been thinking about getting one of the pedi rollers for a while and wondered if they ever did really work. Now I know they do, I think I'll invest in one. This looks great! I don't look after my feet enough, but I'll have to look at trying this before my holiday! I really need it in my life . I seriously need this because my skin is so rough on my feet! Feet definitely don't get the TLC they deserve! Don't know about you, but I always find spending a little time on my feet makes me feel extra pampered and destressed.